Mel Bochner, Triangulations (3/3/3), 1966. Ink and spray paint on paper, 18 3/4 x 24 inches. Mel Bochner, Untitled (Shop Drawing for One/Two/Three), 1966. Ink on graph paper, 11 3/4 x 8 5/8 inches. Mel Bochner, Untitled (Study for Cantor's Paradox), 1966. Ink and pencil on paper, 10 3/4 x 8 1/8 inches. Mel Bochner, 3, 1966. Ink and pencil on graph paper, 8 1/2 x 11 inches. Private collection. Mel Bochner, Study for Portrait of Robert Smithson, 1966. Ink on lined paper, 12 1/2 x 8 inches. Mel Bochner, Study for Double Solid Based on Cantor's Paradox, 1966. Ink and pencil on graph paper, 8 1/2 x 11 inches. The Art Institute of Chicago, Gift of the Irving Stenn Jr. Drawings Collection (2004.892). Mel Bochner, Untitled (Study for 3x3), 1966. Ink and pencil on graph paper, 8 1/2 x 11 inches. The Art Institute of Chicago, Gift of the Irving Stenn Jr. Drawings Collection (2004.890). Mel Bochner, Study for Sculpture (5-part Progression), 1966. Ink on graph paper, 11 x 8 1/2 inches. Ink and pencil on graph paper, 11 x 8 1/2 inches. The Art Institute of Chicago, Gift of the Irving Stenn Jr. Drawings Collection (2004.894). Mel Bochner, Untitled (Study for 3-Way Fibonacci Progression), 1966. Ink on graph paper, 11 x 8 1/2 inches. The Art Institute of Chicago, Gift of the Irving Stenn Jr. Drawings Collection (2004.895). Mel Bochner, Untitled ("Child's Play! ": Study for 7-Part Progression), 1966. Ink on paper, 5 2/3 x 7 inches. The Art Institute of Chicago, Gift of Louisa Stude Sarofim (2009.190). Mel Bochner, Cantor's Paradox #2, 1966. Ink and pencil on graph paper, 8 1/2 x 11 inches. Mel Bochner, Cantor's Paradox, 1966. Ink on graph paper, 8 1/2 x 11 inches. Mel Bochner, Project: Room-Block, 1966. Ink and pencil on graph paper, 8 1/2 x 11 inches. Mel Bochner, Project: Forced Perspective, 1966. Ink on graph paper, 8 1/2 x 11 inches. Mel Bochner, (N + 1) Center Sets, 1966. Ink on graph paper, 11 x 8 1/2 inches. Mel Bochner, 36 Photographs and 12 Diagrams: Set A, 1966. Documentary photograph, 10 x 8 inches. Mel Bochner, Serial Sculpture E, 1966. 84 wooden blocks painted black, 12 1/4 x 12 1/4 x 7 inches. Mel Bochner, Isomorph A4, 1967. Photograph, 16 1/4 x 16 1/4 inches. Mel Bochner, Reversal Quadrants (Stepped ), 1966. Ink on graph paper (cut out), 17 x 22 inches. Mel Bochner, Four Sets: Rotations and Reversals, 1966. Ink on tracing paper, 12 x 15 inches. Mel Bochner, Constants and Variables: Horizontal Striations, 1967. Ink, felt tip pen, and pencil on graph paper, 13 x 19 inches. Mel Bochner, Plan for Color Photo Piece, 1967. Ink, felt tip pen, and pencil on graph paper, 13 x 19 inches. Mel Bochner, Order 10 Square: Counting 1-100, 1966. Color ink and brown pencil on graph paper, 17 x 22 inches. Mel Bochner, Projected Plan for 42 Photographs (Tri-Axial Rotation of a Cube), 1966. Pen, ink, and colored pencil on paper, 17 3/8 x 22 1/8 inches. Mel Bochner, Untitled (Study for Isomorphic Circles), 1967. Pencil on mylar, 8 1/2 x 11 inches. Mel Bochner, Project for a Photo Piece, 1967. Felt tip pen and pencil on graph paper, 10 x 10 1/4 inches. Mel Bochner, Twelve Sets (Visually Random) Magic Square Order, 1967. Photo collage on board, 10 5/8 x 10 1/2 inches. Mel Bochner, Superimposed 'G-L' Squares, 1966. The Baltimore Museum of Art, Gift of Barry Le Va, New York (BMA 1981.186). Mel Bochner, Number Series (Study for Magic Squares: Visually Random), 1966-67. Ink and paper on graph paper, 17 3/8 x 22 1/2 inches. Mel Bochner, Scorecard Drawing (Mel Bochner and Sol Lewitt), 1966. Ballpoint pen on scorecard, 4 5/8 x 11 1/8 inches. Mel Bochner, Untitled (Euler's Square), 1966. Ink on graph paper, 11 x 8 1/2 inches. Mel Bochner, Isomorph (Plan for a Photo Piece), 1967. Ink and felt tip on graph paper, two sheets: 13 x 19 inches, each. The Whitney Museum of American Art, New York, Gift of Norman Dubrow (77.101a-b). Mel Bochner, Study for Photo Piece (One Point Perspective), 1967. Mel Bochner, Dispersed Perspective (One Point), 1967. Photocollage and pencil on board, 17 x 17 inches. Mel Bochner, Tracing (Surface Deformation): Recrumpled, 1967. Ink on tracing paper, 7 x 4 5/8 inches. Mel Bochner, Untitled (Deformations), 1967. Ink on graph paper, 10 x 8 inches. Mel Bochner, Surface De/Formation, 1967. Gelatin silver print mounted on Masonite, 30 x 20 inches. Mel Bochner, Proposal for Wall Piece: Grids, 1968. Enamel spray paint and pencil on paper, 18 x 24 inches. Mel Bochner, Proposal for Wall Piece: Smudge, 1968. Blue pigment and pencil on paper, 18 x 24 inches. Susan and Larry Marx, Aspen, CO.
Blue powder pigment on wall, 17 x 39 inches. Collection of Carla Emil and Rich Silverstein. 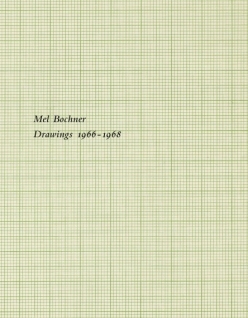 NEW YORK – Mel Bochner: Drawings 1966-1968 will be on view at Craig F. Starr Gallery from April 3rd through May 22nd, 2015. The exhibition comprises over fifty works - primarily drawings, with related photographs, a wall drawing, and a sculpture. The works, many on view for the first time, are largely motivated by information systems that demonstrate mathematical, linguistic, perceptual, and geometrical principles while raising them to the level of art. The exhibition is the first to present as many examples from this singular body of work and thus illustrates the unifying conceptual, narrative thread that runs throough this period of Bochner's artistic production. The works on view engage seriality, language, counting, measurement, shape, and spatial orientation in varied compositional structures and translates them into different systems. On the heels of Minimalism, Bochner's work constitutes an extended interrogation of structure and form on a more explicitly conceptual level. For example, Cantor's Paradox #2 (1966) is the schematic representation on gridded perspective paper of a proposed sculptural object derived from a previous, two-dimensional attempt to visualize the mathematical expression of infinity. Serial Sculpture E (1966) is a highlight; a construction of 84 painted two-inch by two-inch wooden blocks, it was originally one of twelve configurations documented photographically and diagrammatically in 36 Photographs and 12 Diagrams (1966). This occasion marks the sculpture's first-ever presentation in a public exhibition. Previously, Bochner's block configurations were seen via his photographic works, which illustrate the numerous possible permutations and set-ups — the substitution of photograph for sculptural object suggests a dematerialization characteristic of Bochner's practice. He continued to explore these ideas in works such as Isomorph A4 and Constants and Variables: Horizontal Striations (both 1967), also on view. Mel Bochner: Drawings 1966-1968 consists of loans from the artist, the Art Institute of Chicago, the Baltimore Museum of Art, the Whitney Museum of American Art, and several private collections from across the country. A fully illustrated catalogue with an essay by Jeffrey Weiss, Senior Curator at the Solomon R. Guggenheim Museum, accompanies the exhibition. Mel Bochner (born 1940, Pittsburgh) received his BFA in 1962 from the Carnegie Institute of Technology. His work can be found in prominent private collections and numerous public collections worldwide. He lives and works in New York City. This is his first exhibition at Craig F. Starr Gallery.